Thousands of commuters across the D.C. region drive over bridges with failing decks or structures every day, but Maryland, Virginia and the District appear to be doing a better job of addressing that problem than other parts of the country. A nationwide review of structurally deficient bridges by the American Road & Transportation Builders Association group identified more than 47,000 bridges — which support 178 million daily vehicle crossings — to be in poor condition. Two bridges in Maryland are among the top 20 most heavily traveled, both on the Beltway over Md. 214 in Prince George’s County. The State Highway Administration recently began years of work to replace those bridges. They carry an estimated 203,660 vehicles each day. Four other deficient Beltway bridges in Maryland are not far behind — carrying around 180,000 vehicles per day over the Suitland Parkway and Suitland Road. Just because those are the most heavily traveled does not mean they are in the worst condition or are the most dangerous. In the same area, there are a number of structurally deficient bridges that carry far fewer cars but are still somewhat busy. The same is true in other parts of the area with a number of bridges requiring critical repairs, including those on Routes 1, 3 and 17 in Stafford County, Spotsylvania County and Fredericksburg, Virginia. Interstate 270 bridges over Md. 85 in Frederick County, Maryland, also require critical repairs and are among the top 200 most heavily traveled — carrying 109,670 vehicles each day. An Interstate 66 bridge in Arlington is the only one in Northern Virginia on the most heavily traveled list. The information was reported by state and local transportation officials to the Federal Highway Administration based on inspections that are done every few years. Compared to other states, Maryland, Virginia and the District are in the top third when it comes to the lowest percentage of bridges that are structurally deficient. “In states with the most challenges, over 20 percent of bridges in the area are classified as structurally deficient, so in this area, it’s a little bit less than 5 percent for Maryland and Virginia,” ARTBA chief economist Alison Black said. Thousands more bridges need repairs, but are not yet structurally deficient. Virginia rates 646 of the state’s 13,931 bridges that qualify for the report as structurally deficient, continuing a decline over the last three years. 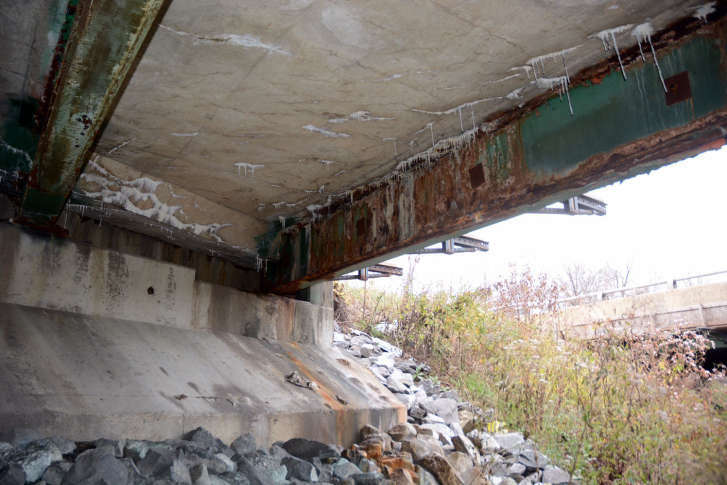 Maryland rates 274 of its 5,357 bridges that qualify for reporting as structurally deficient, a second straight year with a decline. The District reported eight of its 244 bridges as structurally deficient. “These are bridges [where] one of the key structural elements is rated in poor or worse condition,” Black said. The industry group believes progress is too slow across the country. “At this rate, it would take over 80 years to fix just the bridges that are structurally deficient,” Black said. “States are trying to address this, it’s just the funding challenges even with the revenue increases we’ve seen in Maryland and Virginia, it still is not enough to meet the overall infrastructure needs,” she added. Virginia lawmakers will consider raising some additional funding for interstate projects at the reconvened session Wednesday.